Cheesecake With Raspberry Topping - Gluten Free! 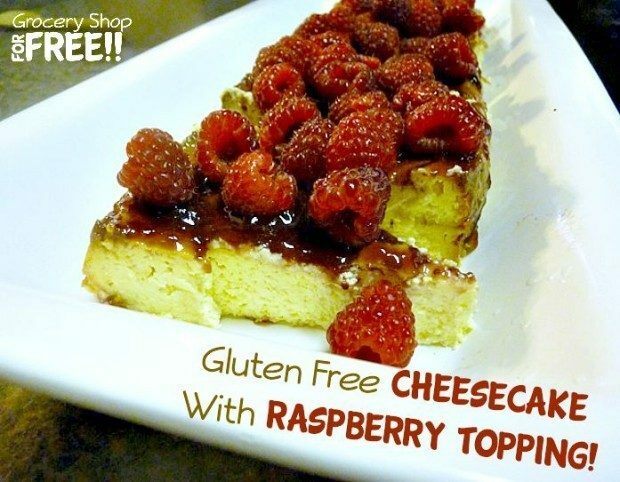 You are here: Home / Recipes / Cake Recipes / Cheesecake With Raspberry Topping – Gluten Free! Cheesecake With Raspberry Topping – Gluten Free! Susan from Permanent Posies is back with another great recipe! This one is Gluten Free for those of you adhering to a Gluten Free diet. Cheesecake With Raspberry Topping! So, I will post the original recipe and the lighter version in the parenthesis. I did not try it with Splenda but I have heard it is pretty good. As you can see, I cut it into pieces and served them on a long platter. Mix crust and pat into bottom of greased spring foam pan. If you have enough to go part way up the sides….great. Beat cream cheese until smooth. Add rest and mix until smooth. Pour over crust. Leave crust off all together if you are going gluten-free, low calorie or low carb. Bake at 350 for 1 hour (45 minutes of this is cooked uncovered and the last 15, covered). You don’t want it too brown (like mine was). Turn off the oven and leave it in the oven until cooled completely. Take out of spring form pan and put on plate. Pour your jam into a bowl and stir it to make it pourable. If you need to put it on the stove on low for a couple of minutes and add a few drops of water to get it able to pour, I think that would work. I used some homemade jam and it was sort of runny and poured over the cheesecake nicely. Put in the refrigerator over night or for at least 5 hours. Top with fresh raspberries before serving. Of course, your topping can be anything you want, if you don’t like or have raspberries or raspberry jam.